Lebanese Café Blanc with Honey. Plus snack. Home » Rose Water & Orange Blossoms Blog – Fresh and Classic Lebanese Recipes » Stories and Recipes » Drinks » Lebanese Café Blanc with Honey. Plus snack. The root cause may be stress, a.k.a. my personality, or my genetic cocktail, or a combination of the two, but the bottom line is: my constitution can be, well, sensitive. Took me a while to figure out that a change in diet can do a body good, and once I got on board with that, good things came my way. But it meant a complete eradication of soda, coffee and tea from my diet, including decaf (I was never an herbal tea drinker but went for decaf black and red teas). Out with the bad beverages went some of the bad eating habits, which meant trying to eat, as they say, “lots of small meals.” To me that’s just another way of saying “snacks.” And I love snacks, especially the kind that meet my criteria of tasting good while being good for me. There was a time when my snacks consisted of mid-morning, Chicago office, two pieces of chocolate from the bowl on my desk. Then again mid-afternoon, after a nutrient-poor lunch if any, two to four small (that was the justification) pieces of candy from the bowls on other people’s desks. By 5 p.m. I was a shaking, jittery mess with a blood sugar dive that made me seek food like one of my brother’s black labs, sniffing madly until anything that remotely resembles something edible is found. I started drinking skim milk steamers sweetened with honey from Starbucks. I’ll never forget the look on one of my co-workers’ faces when I said that steamed milk with honey makes a good snack (I dare say she was someone who ate a chocolate cream cheese muffin the size of my fist every morning, quite literally, for breakfast. It looked damn good but it didn’t do much for the waist-line). The steamer is great once a day but doesn’t cut it for all-day drinking, which I am supposed to do to avoid another kidney stone and which I want to do to keep all sorts of ills at bay. Then last year when I was in San Francisco and drinking warm honey-water to keep the bay chill off, I saw in one of my Lebanese cookbooks a recipe for Lebanese white coffee, or café blanc. It’s not coffee at all, but a digestive of hot water scented with orange blossom water, or mazaher. How brilliant, I thought, especially since I adore the scent and flavor of mazaher but only used it when I made Lebanese pastry. I remember the morning I made my first cup of cafe blanc with honey in my little house on a rainy spring morning in San Francisco. Elixir of the Gods! 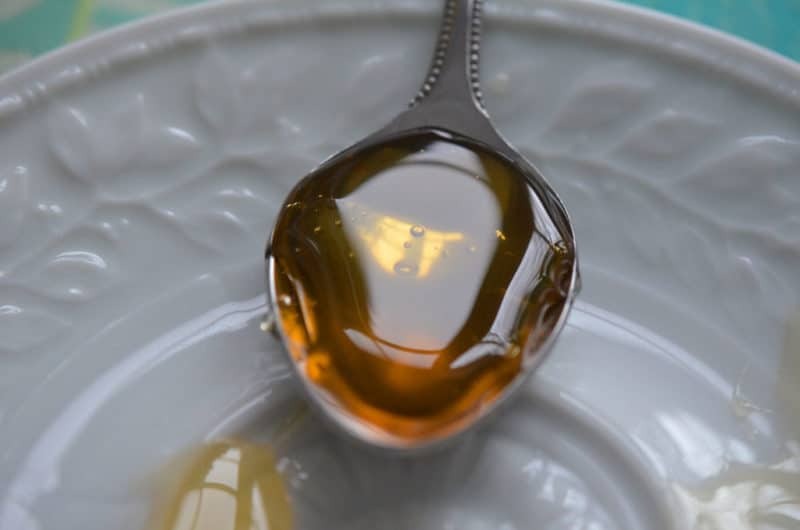 Here in Harbor Springs this winter, I’ve been drinking four or more mugs of hot café blanc with mazaher and a hefty spoonful of raw honey every day. It’s my treat, my warm little niceness throughout the day. I drink it with my snacks—one of the best parts of the day, isn’t it. Whenever I asked my nephew, back when he was in preschool, what he did at school that day, he always said, “we had snack.” My dad referred to his snacks as “crunchers and fizz,” which to him meant any snack anyone would be willing to fix for him. I don’t go for the fizz, but I love a good cruncher. I’m partial to a small plate of dried apricots and a handful of pistachios to go with my café blanc. The salty-sweet is dead on and helps keep me from wandering too often to the Lay’s potato chips, which are, let’s face it, the ultimate good cruncher. Try the exceptional ingredients for cafe blanc using the Lebanese Cafe Blanc kit from Maureen Abood Market! Stir up your cafe blanc and remember that not all drinks have to be colored to taste good. 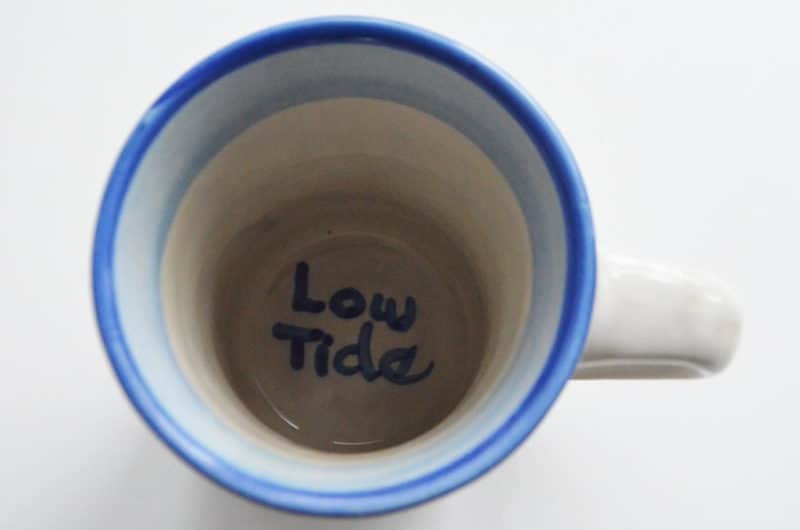 Yes, it looks like a mug of hot water, but the flavor and scent are…divine. 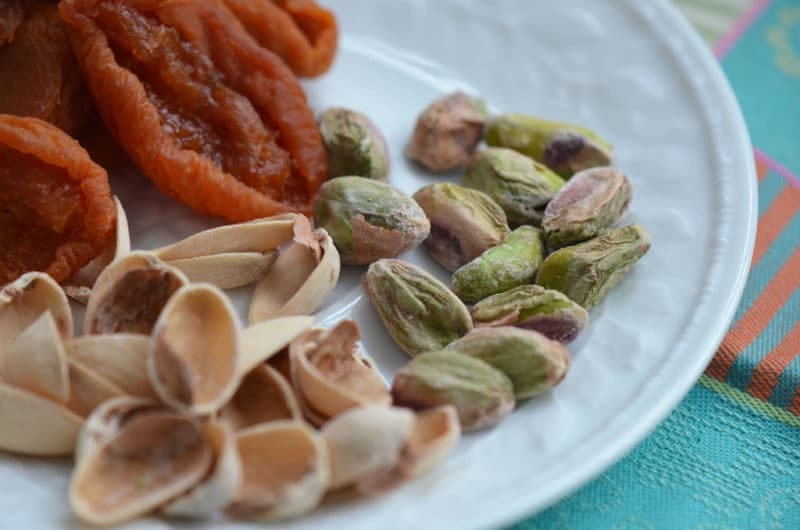 Small plate of apricots and pistachios. Now get back to work, careful not to get pistachio dust on your keyboard. 31 Responses to "Lebanese Café Blanc with Honey. Plus snack." You are totally brilliant. I never heard of Cafe Blanc, BUT, could never get enough of mazaher (just the aroma once a year when my Mother made batlawa (sp?) and could never get enough of Labne (now thanks to Sunflower markets here in NM and AZ, I can have labne anytime–not quite the same as my mother’s labor intensive/days version, but good enough for the moment. 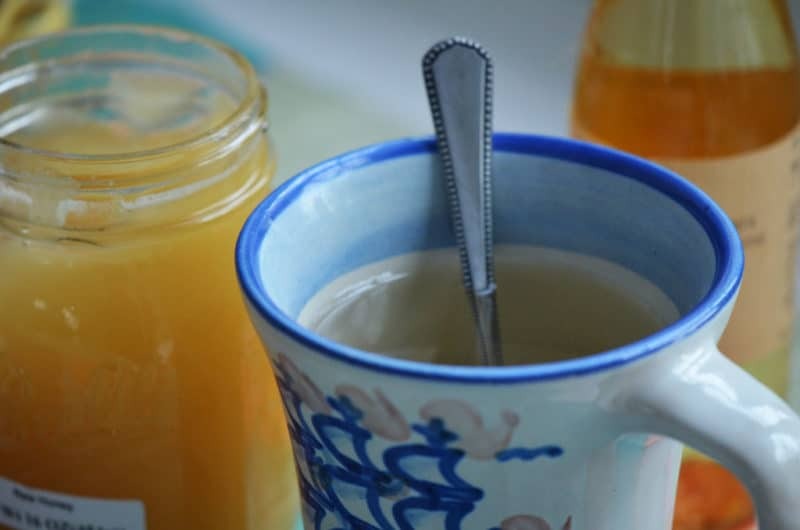 I have been drinking hot water with local raw honey for the past week–NOW to make Cafe Blanc!!! Blessings to you always dear, sweet Maureen! We are soul sistas, Diane, that we both drink honey water and find it so good. This drink is addictive for devotees of mazaher, like you and me! And your mother’s labne…I’d love some right now, on toast. 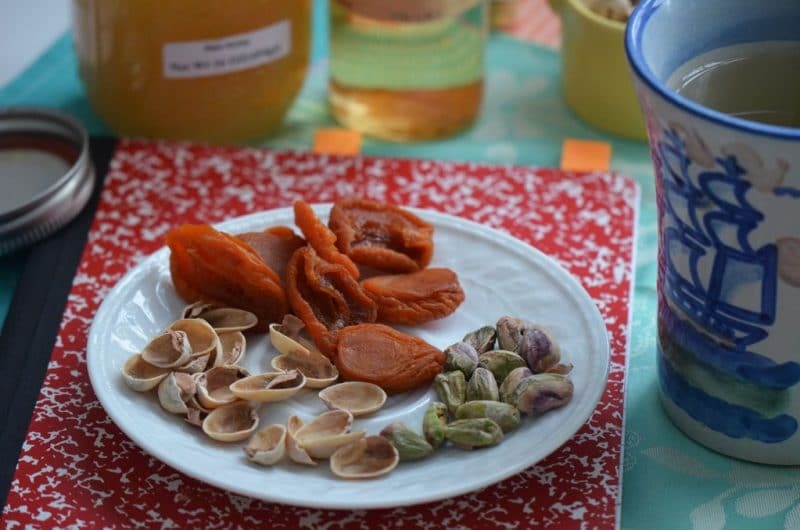 Oh, and by the way, the apricots and pistachios are a divine combo. Always love your pictures. Your writing and pictures must be inspired by your ability to tap into the humaness of all. The opening sentence is both savory, revealing, funny and resonating. Thank you for all your contributions, very inspiring. I am honored by your comment. Thank you so much. I had not heard of Mazahar in hot water, with honey. Going to try it though…I have used Mazahar in Lemonade during the summer days. Love the flavor, smell and now will make Cafe Blanc. Thanks for your always inspiring stories. I bet mazaher is delicious in lemonade too…..thanks Janet. Hope you are enjoying the sunny south–it’s freezing up north!! I love it, Maureen! Never heard of Mazahar or Cafe Blanc, but years ago I used to work with a girl who always had two cups of boiled water with just lemons in it. No tea, coffee, etc. And I love something hot to sip… more of a tea drinker, definitely not coffee. Plus must wean myself off the Diet Pepsi (I know, I know). So I will go hunting for Mazahar. And dried apricots. Pronto. And I will share this with my cousin, who thinks she is more Lebanese than me. haha. By the way, your photos are gorgeous, as is your writing. I love the way your story unfolds, like little snacks. A thought and a photo. Another thought and a photo. So yummy! Maureen – this is one of my favorites!! I discovered it when Brett & I were in Lebanon in 2006. It is great on a cold day. How cool Holly!!! Great to hear from you! Thank you again Maureen ! Great ideas, I wonder how rose water would substitute for the Mazahar? I didn’t read well enough the first time through, didn’t know what it was, the bottle of orange water had mymoune on the label it, but that wasn’t even close to Mazahar. So I used Wikipedia and it didn’t make a note of flavoring or orange water. So I Wikipedia’d orange water and it didn’t mention Mazahar. I finally looked over your article again, sure enough you mentioned both in the same line. I am used to pistachios with my vodka drink before dinner and have used orange bitters with the vodka (mostly because Ross’ had a bottle on clearance) but never thought of orange water! As for apricots…..well I am sure they are good for you. Keep up the great articles, your emails are one of the few that I have not “filtered” into an obscure folder (like the airlines, car rental companies and bank notices). I see them in my inbox and enjoy reading them. Jerry, I’m so happy to hear that you are reading and enjoying. Thank you for taking the time for that and to comment. Rose water is also delicious in this drink but it’s much more floral to my palate than the orange blossom water, and therefore it can taste perfumey. A very tiny bit goes a loooooong way. I find myself the mazaher to be just the ticket, especially since it’s what we’ve always used in the baklawa, so drinking it hints of baklawa, and I love that! I like the idea of these fragrant waters in cocktails. I will try with vodka (my poison of choice too). After I shared my new found obsession of cafe’ blanc at work, it was decided that next week on Saturday I would bring in all the fixings and Abby would bring in something sweet. We will toast you ,that day . Lucy, how neat!! I’m honored…and wish I could be there to share a cup and a chat with all of you. My best to everyone there! Mmmmmm…I’m on my way to the kitchen now. I have some wonderful honey from my Uncle and I can’t wait to use it. Thanks! I just saw this on Healthy Aperture, and it sounds delightful! Fortunately I can tolerate a little affeine, and have my morning coffee, mid-morning Green Tea, and afternoon Holy Basil tea on a regular line up. 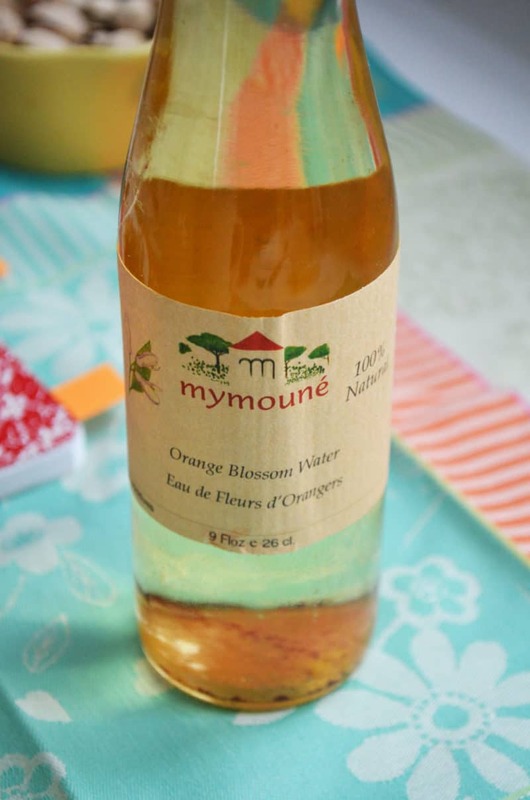 The orange blossom water sounds lovely, and especially delightful when paired with the pistachios and apricots! Hi Spicy! So glad to see you here and to know that you saw the cafe blanc on Healthy Aperture. Your Holy Basil tea sounds wonderful too!! Thanks for your comment and hope to see you back. I had Cafe Blanc a few weeks ago in London on Edgewater Road at a great Lebanese restaurant. It was served in a large cup, holding at least 12 ounces. Floating in the cup were about five 1/4 inch cubes of lemon that included the peel. The lemon balanced nicely with the orange blossom water. It was not served with honey, however I think that would also be nice. It was quite enjoyable as it was rather cool and overcast that day. The owner said he used about a cap full in the cup and recommended the brand Cortas which he said was from Lebanon and natural. I have since bought Cortas Rosewater and have added a little to black tea which is very good. I have learned to be careful in buying some flower waters as they may be flavoured with artificial flavours that are petroleum based. Steven, your cafe blanc in London sounds excellent! And I like your idea of adding a touch of rosewater to your black tea, as well as the lemon in the cafe blanc. And yes, some flower waters are better than others–I do ilke Cortas and it is widely available in Middle Eastern shops here. I cannot thank you enough for sharing this delightful drink with me. This drink has been a lifeline for me . In October I purchased 4 bottles or rosewater and the same of Orange Blossom. I have plenty of honey. When at home I would drink pots of this wonderful manna . zero issues..YEA I am cured…. Now that it is Spring I will enjoy it iced. Staying hydrated is so much easier…thanks again. That is just great, Lucy! Thank you! That is just great Lucy, thank you!